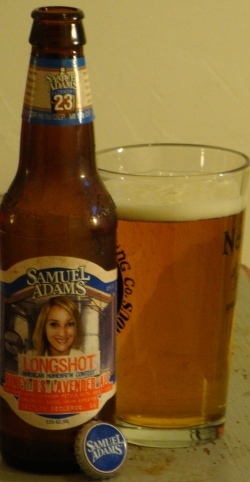 The Boston Beer Company, makers of Samuel Adams, run a really neat program called Longshot. They host a homebrew competition with the top prize a chance to recreate the recipe as a commercial batch. Some percentage of the winners are various staff members at Sam Adams, showing the culture of innovation BBC fosters. Tonight I will be tasting the three Longshot beers available this year. BBC employee Caitlin Declercq brewed a light ale with lavender and honey, Honey B’s Lavender Ale. Richard Roper crafted what sounds like a Belgian IPA, the Friar Hop Ale. Finally I will have Rodney Kibzey’s Blackened Hops, an example of the new style Cascadian dark ale. First up, Honey B’s Lavender Ale. A dense off-white head sits atop this brilliantly clear golden straw beer. The nose is fairly strong, with the floral lavender being the most prominent. A rich herbal and citric hop aroma adds another dimension. However, it is all just a bit too sharp. The flavor is very bright and spicy, almost like a ginger beer. The herbal lavender flavor and earthy hops create this rich spiciness. A bit of alcohol adds a warming sensation, and the honey brings just a bit of a tempering sweetness. Very refreshing, again like a ginger beer. However, just like with the nose, the flavor is a shade too intense. Next, the Friar Hop Ale. This nearly clear copper-colored beer has some off-white head. 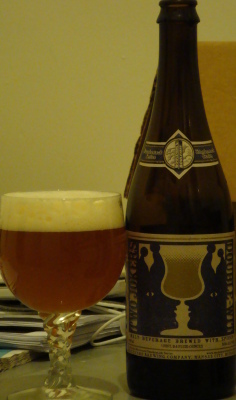 The nose is a sweet combination of toast and caramel from the malt and spiciness from the yeast. A citric hop aroma rounds it out, but the spicy maltiness is significantly stronger. The flavor is strongly spicy. Black pepper character from the yeast melds perfectly with the coriander spice addition and slight alcoholic bite. Citrus hop flavor likewise combines with bitter orange peel. A light caramel malt flavor supports it all, but a richer body would support it better. Finally, Blackened Hops. This one finally has a generous, rich, creamy head. It is tan, floating on a nearly black beer. The nose reveals a big citric hoppy character. Rich lemon, orange, mango, and pinapple fruit aroma and just a bit of a resinous pine. Almost no malt character detectable. The flavor is seriously bitter. Strong citrus and pine hop flavor contributes to that intensity. A major roast malt character is trying to break through, however, and does a decent job of it. This burnt bitterness doesn’t exactly mesh well with the citric hop bitterness. The palate is very sweet, to the point of being cloying. One last note – if you homebrew, enter next year’s Longshot competition and if you win you just might have your beer reviewed on this very blog. 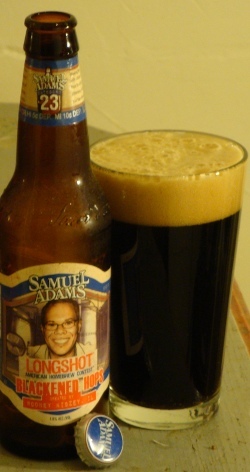 To enter, head on over to www.samueladams.com/longshot.